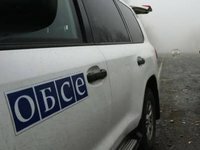 A patrol of the OSCE Special Monitoring Mission has come under attack by unknown persons on the northeastern outskirts of Holmivsky in an area uncontrolled by Kyiv, 49 kilometers northeast of Donetsk. The attack on an SMM patrol consisting of five SMM members and two armored vehicles happened on the morning of 16 August, the OSCE SMM said on its website on Friday. "The patrol was part of two patrols, positioned on both sides of the contact line in order for both patrols to facilitate and monitor adherence to the ceasefire for repairs of a power line by Voda Donbasa (Donbas Water) and maintenance to an SMM camera at the entry-exit checkpoint in Mayorske (government-controlled, 45km north-east of Donetsk)," the mission said. According to the mission, "three SMM patrol members were outside the vehicles and the two others were inside. "A member of the armed formations, armed with an automatic rifle, and a Voda Donbasa worker were speaking to the SMM, while two other armed members of the armed formations (also with automatic rifles) and two Voda Donbasa workers were in a van parked nearby," it said. "At 09:14, the three patrol members outside the vehicles heard an undetermined explosion approximately 500m north and another undetermined explosion about 500m south-south-east, followed by about ten shots of small-arms fire 100-150m north and north-west, two of which were assessed as flying over the heads of the three patrol members who were outside the vehicles," the mission said. "The patrol got into their vehicles immediately and left the area and later returned safely to its forward patrol base in Horlivka (non-government-controlled, 39km north-east of Donetsk). The armed man and Voda Donbasa worker boarded the van, which departed the area," it said. "The SMM notified the Ukrainian Armed Forces side of the Joint Centre for Control and Co-ordination and the armed formations about the incident and requested follow-up," the mission said.